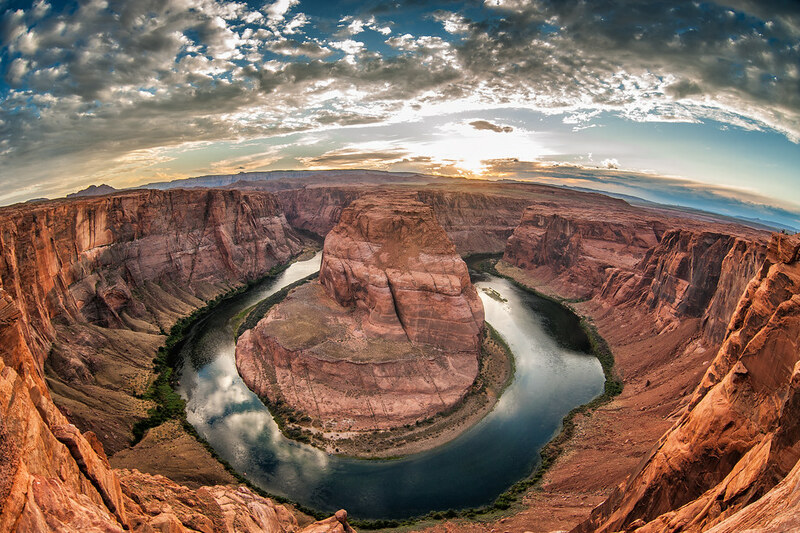 Horseshoe Bend is a very popular photo attraction in northern Arizona where the Colorado River makes a sharp curve. Having just wrapped up an amazing adventure in the Grand Canyon the day before, and knowing that I would be visiting Antelope Canyon shortly after, I wasn't that disappointed that this place is a total tourist trap. Just off the highway in Page, AZ there is a huge parking lot where visitors can park and walk a quarter mile to the bend. When I arrived at the bend near sunset, there were hundreds of people there including dozens of photographers hovering around their tripods securing the most coveted spots of the bend to capture the sunset. There is no fence, rope or other security device preventing tourists from falling the several hundred feet onto the rock below. As if that alone wasn't enough to make me feel uneasy, there were multiple drones hovering directly above the ledge. The curve of the Colorado River at Horseshoe Bend in Page, Arizona.